After the Field Museum Women in Science and Art blog post, many of you wanted to find out more about what is new about my job at the museum. 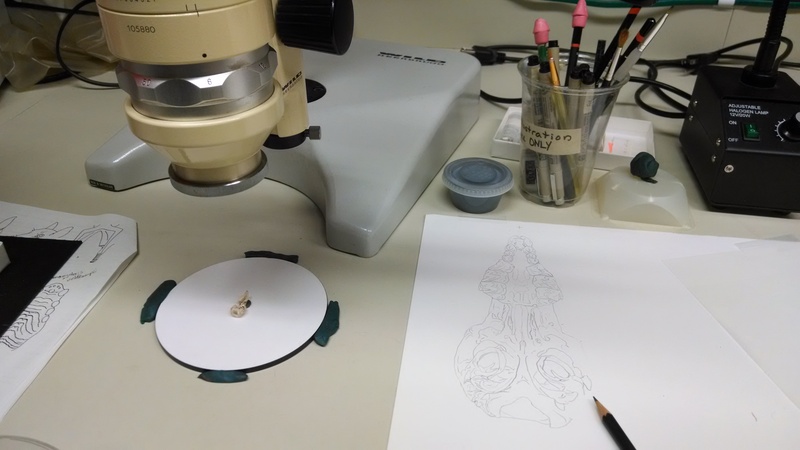 As most of you have read in one of my past posts (Yes, I do have a job to pay the bills…) a couple years ago, I talked about what my job at the museum entails as a Research Assistant and the opportunities I get offered to do what I love, illustrating. Now, as the Mammals Collections Assistant and Preparator, I am doing much more than what I use to do within the Mammals Collection. Bobcat skull that has been prepped and ready for cataloging (or sketching, hmm?). How much “art” is in my daily routine? I do not get to create illustrations or photograph specimens as much as in the past but I take what I do at work daily and incorporate what I learn on the job into my artwork. I take advantage of the many specimens at my finger tips to study and learn how their forms and textures can influence and INSPIRE how an art piece will turn out. This makes it easier to visualize what I will see on paper when illustrating the mounts in the exhibit halls. It’s the LOVE and ENJOYMENT of what I do and where I work that INSPIRES and fulfills “MY CREATIVE PASSION” in the studio. Even if that means sacrificing my time before work, at lunch or on a weekend to come into the my office or lab to illustrate a specimen or a mount in the exhibit halls. The lab, where all the magic, I mean science happens. This is where the mammal specimens are processed before being installed into the main collection. What is the difference in what I am doing now verses two years ago? Well, for one, any mammal specimen that needs to be cleaned has to go through my lab first. I also take care of the mammals beetle colony (Mary Hennen takes care of the Birds beetle colonies). I inherited thousand of little babies who depend on me (but mostly Mary) for food… and a home. Check out the beetles Facebook page, Bird’s Bug Room here. Most people think this is a disgusting part of the job but my time in the beetle room is nice, peaceful, and most importantly, quiet. Cleaning the torso and femurs of a rodent. This rodent was born with a femur deformity. You can see that the left femur is slightly shorter and extremely wider then the right femur. My volunteer staff has grown from five to ten volunteers/interns. I guess mammals has become a popular place over the past two years. I depend on them everyday to help with cleaning bones after the beetles have finished, skinning specimens and stuffing the viable skins for research, as well as, helping with database entry, scanning, numbering bones and photography work from researchers. The numbering and boxing area in the lab. Crocidura monax specimen under a camera lucida microscope with the illustration on the right. Rhinolophus sp. 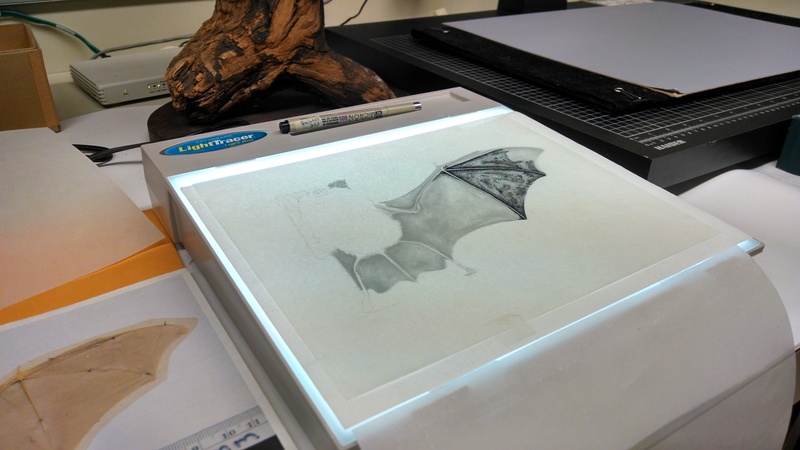 illustration on a light table. Stippling on vellum from a graphite drawing. Next INKtober….enough said: The attempt to do a sketch a day for INKtober and my “failings” at it, LOL!. Stay tuned.